Virginia & Truckee Tunnel Car No. 53 was built in 1875 as V&T flatcar #336. In 1902, it was renumbered to No. 53. Tunnel cars were used to inspect and maintain the interior of the tunnels along the V&T. The open sides allowed easy access to the tunnel walls, and workmen could climb on the roof of the car to inspect the roof of the tunnels. The roof was originally flat, but in 1947, a slope was added. This car served on the V&T up to 1950. 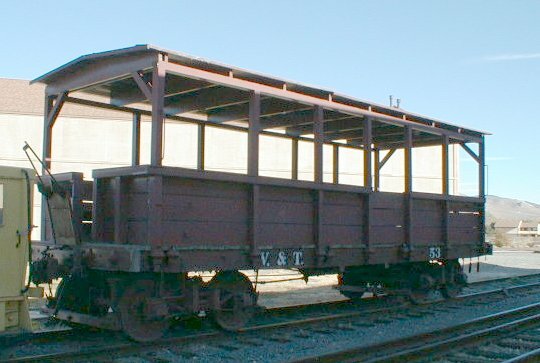 It was transferred to the Nevada State Railroad Museum through the Nevada Heritage Association. This car retains its original appearance, but has been fitted with seats and safety features and now serves to carry passengers during steam-up weekends.